Today I propose a peculiar sweet bread recipe, exquisite, and that really worth trying. 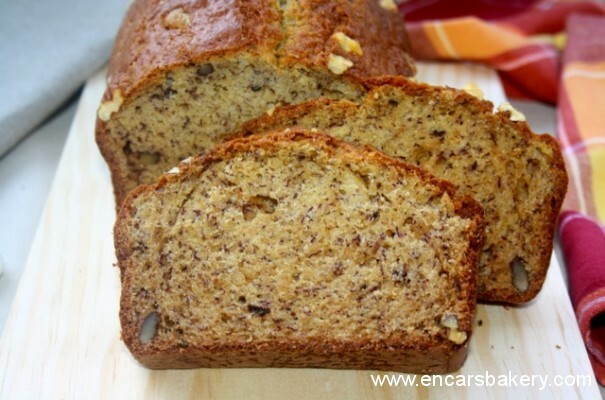 It is a recipe from America, U.S. to be more concrete and, although the literal translation is “Pan de plátano” We can actually say that it is rather a cake. A cake like few, cancellous, really juicy and delicious. I tell you and how to prepare. We prepare a plum-cake mold of 21 cm. long, I greased and baking paper forramos. Peel the bananas and crush with a fork. Booked. In a bowl sift the flour and mix with yeast and baking. Add the vanilla, cinnamon, sugar and salt to the bowl above, and mix. Booked. In another bowl beat the eggs with the oil. We add the bananas and beat again. Pour the mixture of dry ingredients into the bowl of liquid, little by little, three times, beat at all times while. We pour the mixture into the prepared pan and add the nuts into the dough evenly apportioning. We put in the oven, preheated to 180 ª C, for about one hour. Once out, and after a few minutes, unmold the cake and let it cool on a rack. I hope you feel encouraged to do so because, besides easy, is economical and with an extraordinary.